happy friday! it’s looking like the easter weekend will be a nice one…perfect for easter egg hunts, maybe a little grilling, and if it’s dry enough a lawn game or 2.
well…we’ve finally finished up Wildflowers & Ice Cream. it has been well worth the wait. the soft, fresh florals, the scrummy stripe, and flowing paisley…has us feeling on the good summer feels. Plus we got to sneak in a little pink in the setting triangles. Love it! we even have the kits ready to go…they are available online here and in store if you fancy a stop in! i’ve finally gotten the Treehouse Textiles patterns packed up with acrylics and papers…mom is currently making the Dilly Bag so once she is done we’ll have it kitted. I ordered up the June Dyson Coverlet and the Frankie Quilt patterns and have both ready to go. June Dyson was featured in the most recent issue of Simply Vintage. We have the pattern, acrylics, and paper pack available here. 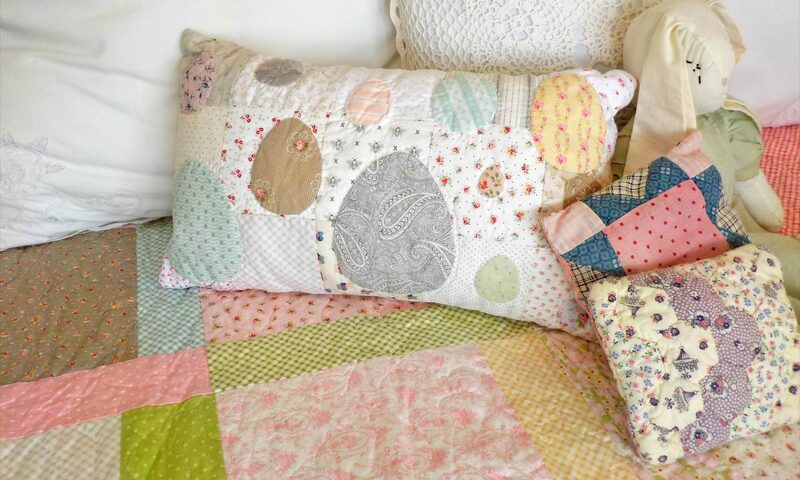 Frankie Quilt…this is the quirky little sister to the Sweet Sunday project. I love the pretty summer star pattern, the low volume prints, and the lovely vintage style fabrics. We have it packed up with the Frankie pattern, acrylics, and papers...here. we’ve gotten in the newest chunky thread pack from Bee in My Bonnet along with the skeins of each color…check out our crochet section of the shop. looks like mom is waiting for me so we can get going…have a wonderful evening! good evening! i know it is a little late, but the day got away from me then dinner with Monica then back to the shop for a little gather up, trim up, and pack up. Lucy is coming along wonderfully…i’m just about to start putting on row 4…all the sashings and cornerstones are done…plus a few extras as seed for the next row…now just need to start stitching them on. hopefully tomorrow i’ll be able to get a couple blocks on…it is my day off…so here’s hoping. we’ve finally finished up Geese in the Garden featuring Garden Variety by Lella Boutique. Her fabrics are just the sweetest…they look so pretty mixed with white…her newest collection came in late last week…Lollipop Garden…they 2 collections look wonderful in the cupboard by the bed. geese in the garden…on the bed in the window for Easter. geese in the garden…i just love those blocks with the white…yum! delectable lollipop garden variety…the pinks are at the head of the bed…i’m planning a combo bundle of the entire grouping of both. we have the geese in the garden kits ready to go…link is here if you fancy a gander. –keep an eye out … we have a few more Treehouse Textiles pattern, acrylic, and paper packs to share with you along with some new chunky threads, embroidery threads, and DMC thread tins…all in good time! good afternoon! hope you are having a wonderful weekend…the snow has finally stopped and is definitely making it a little sloppy outside. our Lollipop Garden order arrived yesterday and our cherry-picked prints are so sweet and blend right in with Garden Variety…and have us thinking of summertime! lollipop garden 12 fq bundle is available now! i realize that Easter is a week away…so this low volume Easter bundle will be arriving late to the party…but the new Chantilly and Lollipop Garden low volume prints were so scrumptious that i new i had to pull a bundle of 12 low volume prints from the shop. Low Volume Easter features a 12 low volume prints from the shop…pindots, bees, flowers, sewing print, butterflies, and a delightful stripe in all the best spring colors…background colors include…vanilla, buttercream, parchment,cloud, cream, and linen and the accent colors cantaloupe, raspberry, grey, silver, aqua, cherry red, and dark chocolate, and fawn. collections included in the exclusive bundle in Poetry, Guest Room, Garden Variety, American Jane Pindot, Modern Backgrounds, Chantilly, Quill, Porcelain, The Good Life, and Amberley. Low Volume Easter fq bundles. i’ve whipped up both fq and 1/2 yard bundles which are ready to ship…so if you want one for a lovely Easter basket stuffer or hostess gift…nab one this weekend and i’ll make sure it ships out on monday so you’ll have it in time for you festivities next weekend. i’ve linked them below. well…it’s past 3 and time for me to get going…have a wonderful weekend! good afternoon! hopefully everyone has had a wonderful weekend and Monday. i had an impromptu monday at home due to a morning migraine…too busy of a weekend getting ready for Melany’s baby shower on Sunday. But now that is over and we had a wonderful time and have lots of candy from the candy bar left…and are now eagerly awaiting his arrival in June. i did get a little bit of stitching in yesterday afternoon and evening! i even had a chance to use my new pink coffee mug…which i kinda love a lot. mom and i are getting ready for our next 2 shows…Fargo and Fergus Falls…which are on back to back weekends–the first 2 weekends of May. i finally had a moment to get Sweet Violet bundles listed online…you can grab one here if you like! we have some new goodies on the way! Susanna’s Scraps fat quarter and fat 8th bundles shipped yesterday and will be here thursday (hopefully the storm will blow by us so we can be here to greet UPS)! Lollipop Garden by Lella Boutique…our cherry-picked collection of prints will be arriving on Friday. lovely orchid, pinkberry, raspberry, sky and apple colored summery prints…scrumptious! good morning! what a wonderful day…i just love foggy, rainy mornings…a most perfect lazy day, however, i have some things to do before i can sit back and relax. 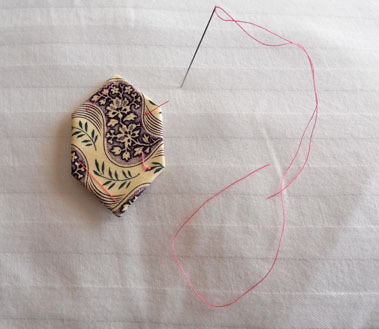 First up…Susanna’s Scraps arrived thursday and i set to work cutting bundles and getting it online. yardage made it online yesterday…the custom bundle today…you can see it all here. factory-cut bundles will be shipping next week. good afternoon! hopefully you have had a wonderful start to your April. we are still trying to get all our ducks in a row. new fabrics, precuts, and notions are arriving along with new Brazilian Embroidery and Ribbon Embroidery kits. it is all these things…plus back to back big shows in both May and June that we think maybe the Anthology Quilt will have to take a break…plus we are impatiently waiting on new Civil War black/grey prints to arrive…all in good time. don’t worry…we won’t just forget about it…it is too darn nifty to forget about. This way you will have a little time to catch-up and we’ll have a little time to get a few other projects stitched up, quilted, written, kitted, and out on the floor. speaking of getting things out on the floor…our 30’s section has been filled up with quilts, fabrics, bundles, chunky thread, and the most luscious solids. English Paper Pieced Double Wedding Ring featuring solids and prints. the pink wall really pops with the 30’s…i’m loving the retro vibe and it’s inspiring us to whip up a new 30’s project using the new 30’s Playtime that arrived a little while ago. 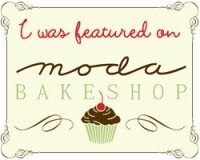 we’ll keep you in the loop! promise! happy stitching…have a wonderful afternoon! good afternoon! i hope you have had a wonderful start to April…we had a little snow and rain today…and at one point i thought i heard thunder or maybe just a loud truck or a train. i’ve been working on Lucy for over 91 weeks now. how is it possible i have been working on it that long? I am loving these early blocks…the colors are so pretty and some of the prints are no longer available so its a pleasure to work with them again. today i worked all this morning to get the final block of the 3rd row on…and i did! so after a quick trip to the post office i thought i better share! i think block 16 and 21 may be in my top favorites…or maybe my row 3 favorites! **30’s section got a new coat of paint…we opted for a retro-ish pink color which really looks nice with the retro fabrics and makes the section look huge! just have to figure out the layout for the fabrics and where to put the quilts. **Susanna’s Scrapbag (our cherry-picked prints) will be arriving on thursday. 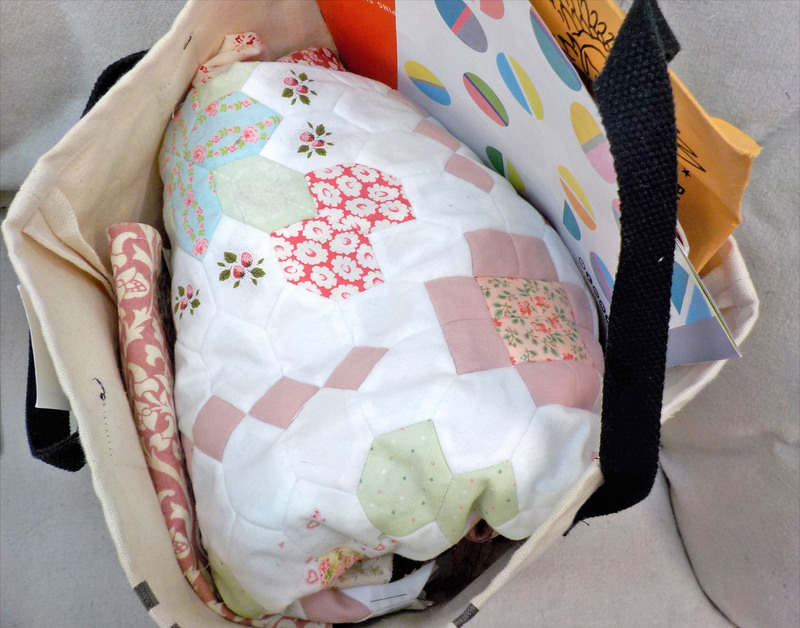 **Scrumptious 4-Patch Tiny Tote…we are still waiting on the twill tape to finish this up…look for it later this week. **Sweet Violet fat quarter bundles. **a little rearrange in the floral section since i have half the Lucy blocks in my bag. **a little rearrange in the civil war section to showcase Rockets’ Red Glare and make room for Susanna’s Scrapbag. **new civil war fat 16th bundles made the agenda since someone nabbed the last one last night and was sent to its new home today, so i’d better get cutting. good afternoon! i finished up our Scrumptious 4-Patch yesterday and ran it through the wash…and let me tell ya…it is scrumptious! Chantilly is Fig Tree’s newest collection and Chantilly is the most perfect name for this range. A soft white (chantilly) is the backdrop for most of the prints we cherry-picked. Tones of luscious melon, gerbera, geranium, and forget me not really bring this collection together and make it perfect for some delightful springtime 4-patches. Ruffle…instead of binding we opted for a hand-torn ruffle in Bella Bleach. the quilt just called for a ruffle to make it even more floofy and girly! kits are available…i’ve linked them after all the pictures…i just couldn’t pick 1 or 2 or 3…they are just so pretty! Scrumptious 4-Patch kits are available here. Chantilly-Inspired DMC threads are available here. Mom just finished up Wildflowers using Porcelain (and it is just lovely) but more on that once it is finished…right now i’m dreaming of orange dreamsicle cake and lemonade. My mini break is over…i did finish up my Le Poulet pincushion and the stitching on the Sashiko style pillow cover…haven’t gotten it made into a pillow yet, but all in good time. Lucy Boston week 90…how has it been nearly 2 years since we started this trip to Lucy’s Summer Cottage? Seems like yesterday i was pulling fabrics…eagerly waiting on new fabrics, trying to keep from using that mint green in every block. i haven’t added any more blocks to her, but i have been working on the next set of cornerstones and sashings…once they are all done…i can just sit and stitch on a row. I get so focused on stitching on the blocks that i’m liking the idea of having all the pieces ready for the entire row…cuz once you get started it doesn’t take long to stitch it. Row 3 blocks are in my bag, so once i finish up that last sashing piece i can get going on it. After Row 4 i’m planning on taking a mini break to work on a little Brazilian Embroidery and a Ribbon Embroidery project…but we’ll see…i may have to buckle down and finish her up…it would be the halfway point! The wall of Lucy’s Summer Cottage blocks sure is looking bare with 21 of them being stitched together and later blocks pulled since their kits are sold out. i’m already looking to the next EPP project and the next after that. Several on my *to finish up in 2019* list. Sweet Sunday by Treehouse Textiles –this projects features a delightful mix of florals and vintage embroideries…so i am on the hunt for vintage linens featuring pretty embroidered flowers, etc. Dusky Flower Garden–i have some center/2 ring flowers that need a ring of white and a path of white…hopefully it can be a summer project. These are 1 inch and super scrummy. Shabby Smitten–i have started a new cotage style smitten…a couple blocks are finished…just need a little time to work on it…thinking i should cut the blocks from my favorite fabrics and have it ready to go when i want to work on something quick and easy. Virginia Snowball–this red, white, blue, and pink lovely is classic, sweet, and patriotic (which i LOVE)! Pastel Primrose Garden–this is cut and ready to go…however, i’ve confiscated all the loose honeycombs for Lucy’s Summer Cottage…so this once is on hold until she’s done. hopefully you can find time to work on your own list…even if you don’t have a chance to work on the projects themselves…at least get a list written up…then maybe cut out a flower, baste some white honeycombs, or bag up a block and toss it in your bag. 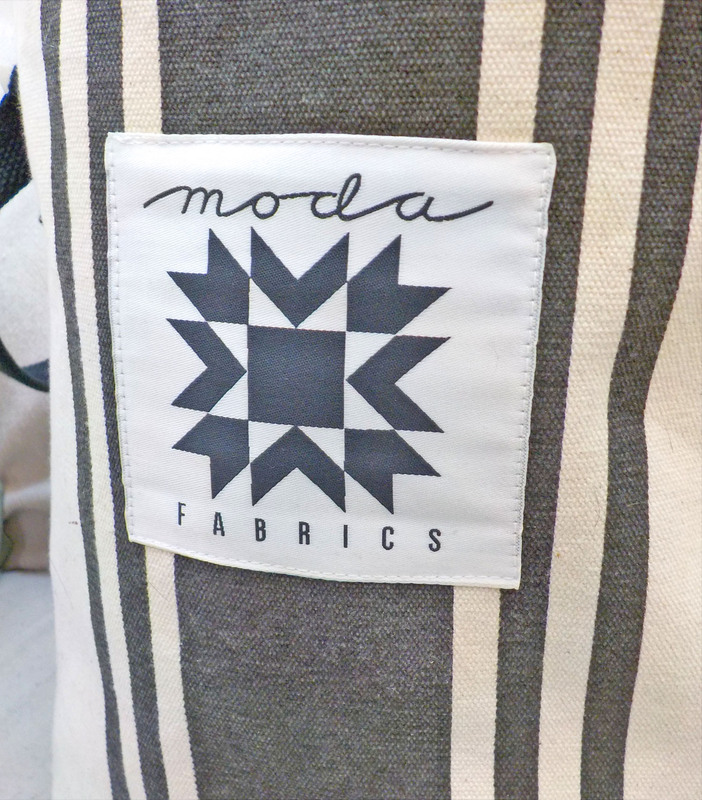 love that little moda patch with the barn quilt style quilt block! It is truly unbelievable how much this bag holds…there are 7 more blocks underneath along with a little moda tin, a couple little fabric bags, my hexie bag, some papers, fabrics, Pandan cookies, granola bars, and of course the new Moda Look Book is sticking out of the top on the right but could easily be stuck down inside. 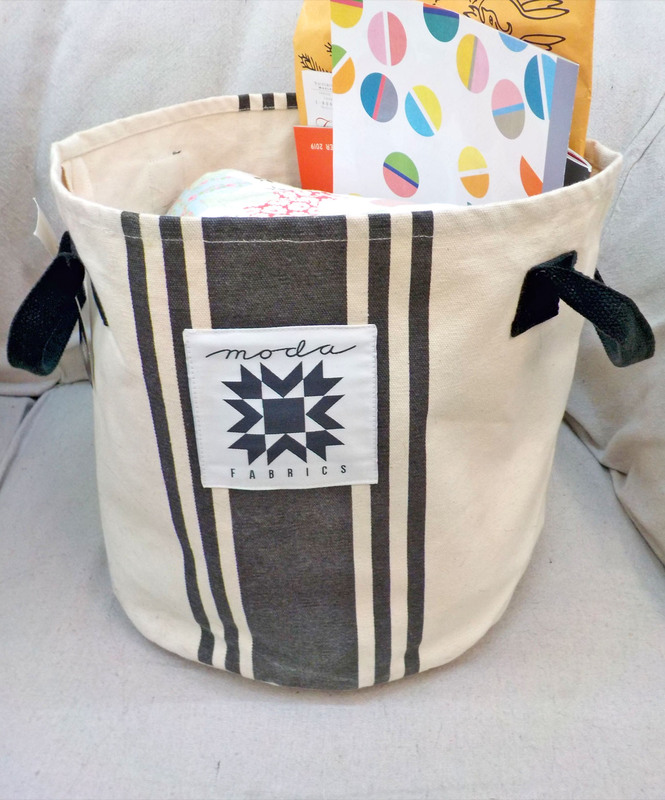 i didn’t mean for the end of this post to be a little plug for this new tote…but if you are in the market for a tote…this one is my new favorite…i have it listed over on the website here. now…i’d better get back to packaging up last night/this mornings orders…then maybe a little rearrange or pattern printed…the jury is still out on that one.